Over the past month, at every stop along the way, Deputy Director Rea and I have received a lot of invaluable input from our user community. 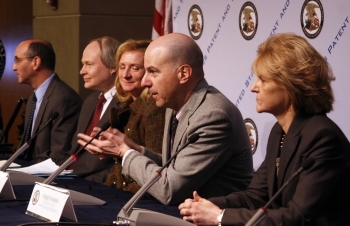 We’ve learned that our efforts to modernize and enhance our intellectual property infrastructure are making a difference for users, from receiving decisions on patent applications in less than 12 months through our “Track One” option, to an aggressive hiring of patent examiners and judges, to our subsequent reduction of the U.S. patent application backlog to an historic five-and-a-half-year low. At the same time, our expansion of international work-sharing programs, such as the Patent Prosecution Highway, is allowing American businesses of all sizes to tap into global markets around the world—ushering in new opportunities for 21st century business. Even in the short span of five months since the AIA became law it’s abundantly clear that our nation’s innovators and entrepreneurs are already taking advantage of the new tools and resources being offered at the USPTO in order to expand their businesses and technologies. But their input has been just as valuable in helping us bring these new resources online and ongoing collaboration with our user community has empowered us to implement seven provisions of the AIA on time, spurring additional momentum in implementing the rest. Ultimately, our efforts will not be finished until our users say they’re finished, and even then we will continue to look for ways to innovate and improve our operations. The realities of our economy and the global marketplace demand no less. To help Americans make the most of our new patent law—cutting costs for entrepreneurs, issuing patents that diminish the likelihood of expensive court challenges, and providing tools to reach patent decisions three-times faster than in the past—the Agency needs inventors and entrepreneurs to continue speaking up. We value their input, and indeed we couldn’t do this without them. To continue that conversation I encourage inventors and entrepreneurs to visit our AIA microsite and to stay tuned for future engagements and updates on the implementation of AIA. In the meantime, see you on the road!